SAN DIEGO--(BUSINESS WIRE)--PaintCare has awarded $10,000 to NANOShorts Entertainment as the winner of an online video contest meant to raise awareness about paint recycling in California. NANOShorts submitted “Spring Cleaning,” a comical video short that features an unsuspecting young man, named Rick, walking his garbage to the curb, which sets off a chain of “telephone-style” miscommunication among his neighbors. Once the confusion and miscommunication are clarified that Rick didn’t blow out his pants, but that he is throwing out paint, the whole neighborhood starts yelling at Rick that he should recycle. The humorous and farcical approach to the topic of paint recycling resonated well with audiences, giving NANOShorts a strong advantage for first place with over 4,000 votes. The runners up, SlapTv and Recycled Babies got 1,359 and 1,330 votes respectively. Don’t forget to follow PaintCare on facebook, Pinterest and YouTube. Paint manufacturers created PaintCare, a non-profit stewardship organization to run recycling programs in states as they pass paint stewardship laws. Through PaintCare, the paint industry sets up drop-off locations for unused paint, arranges for recycling and proper disposal of the paint, and conducts outreach about proper paint management. For additional information, visit paintcare.org. 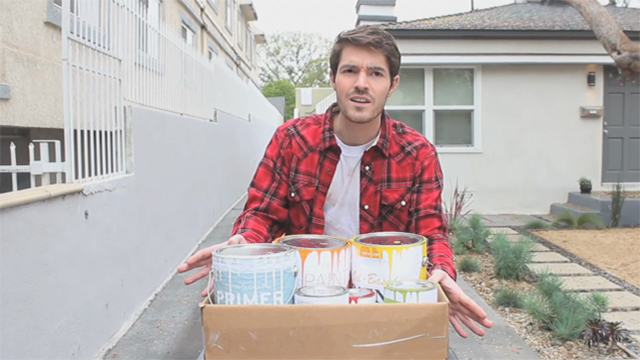 PaintCare awards $10,000 to NANOShorts Entertainment for online video contest to raise awareness about paint recycling.